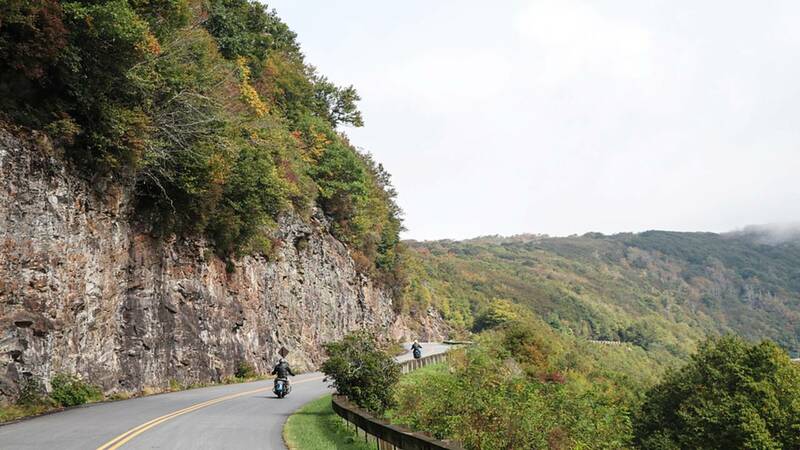 Now that the weather is starting to cool down and the leaves are changing to their Autumn hues, it's a good time to start planning that motorcycle trip to the mountains. Add to that the hurricanes and flooding that are ravaging the East coast, the idea of going West is starting to look more like a sign from up above than just something to do for the weekend. 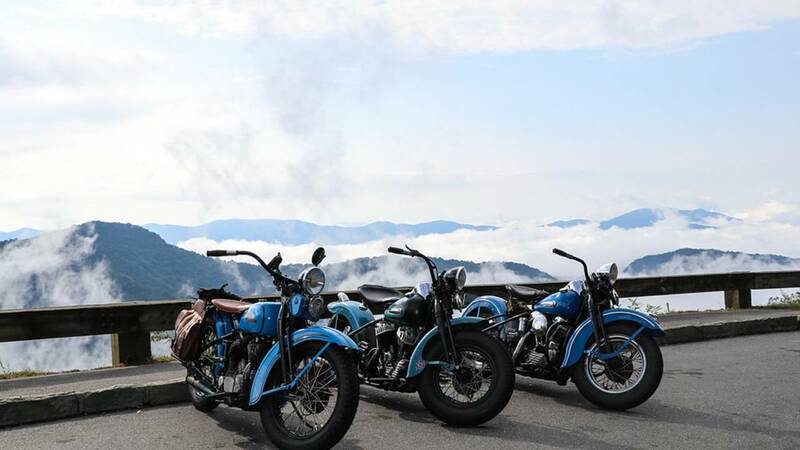 Whatever your motivation, some of the best mountain riding on the east coast can be found in North Carolina, specifically the Blue Ridge Parkway which covers just over 250 miles of roadway through the Appalachian Mountains. Cooler temperatures and the colorful changing leaves make for some excellent fall riding opportunities. 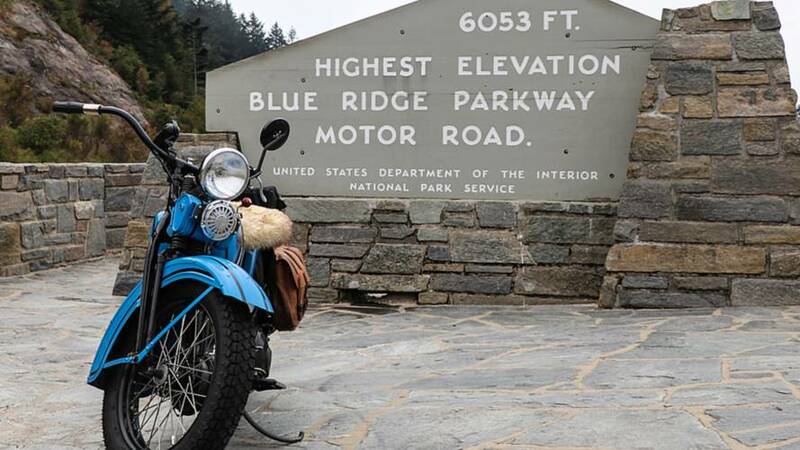 The entire Blue Ridge Parkway covers 469 miles, curving it's way through 29 counties of North Carolina and Virginia, but for this article I'm going to focus on just the North Carolina section. Construction started under the Roosevelt administration back in 1935 and continued right on through until it was completed in 1987. Obviously they ran into a few snags along the way, including a major right of way dispute with the Eastern Band of the Cherokee Indians whose lands the Parkway crosses through. Even with multiple set backs the National Park Service finally persevered and the result is America's longest linear park as well as both a National Parkway and All-American Road. 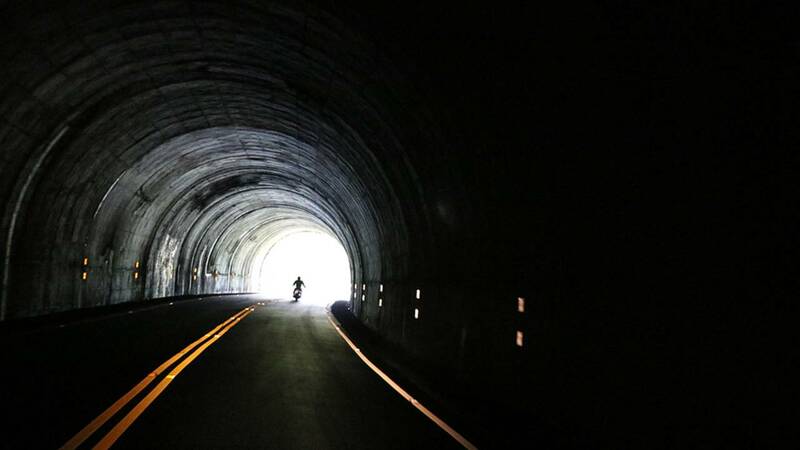 Like riding through tunnels? There are 25 in the North Carolina portion of the Parkway alone. Although it is possible to ride the entire Parkway end to end in couple days of riding, I really recommend starting from a central location and making day trips on different sections. While the Parkway is incredibly scenic and a great road, you will miss out on the "local color" if you just power through. With the speed limit of just 45 mph, you'll also likely to grow bored after hours in the saddle so take the time to stop and check out the views and local attractions. There are plenty of small mountain towns to host your stay, but if you are looking for something a little bit larger, I suggest you give Asheville a shot. The town has a variety of options for lodging, great restaurants and for the beer connoisseur, over 100 local beers served at pubs and breweries around the city. 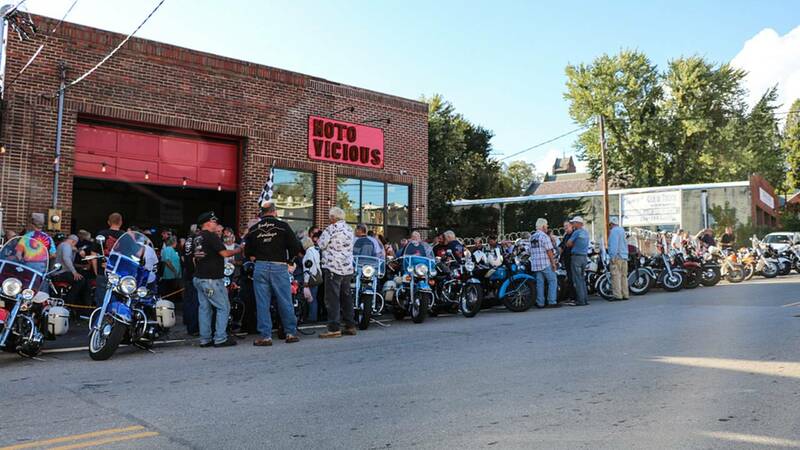 There are plenty of "biker friendly" bars, including Moto Vicious which is a bike shop that also serves beer. Assuming that you are following my advice and basing your stay in Asheville, I'll break things up into the region to the south of Asheville and the region North. 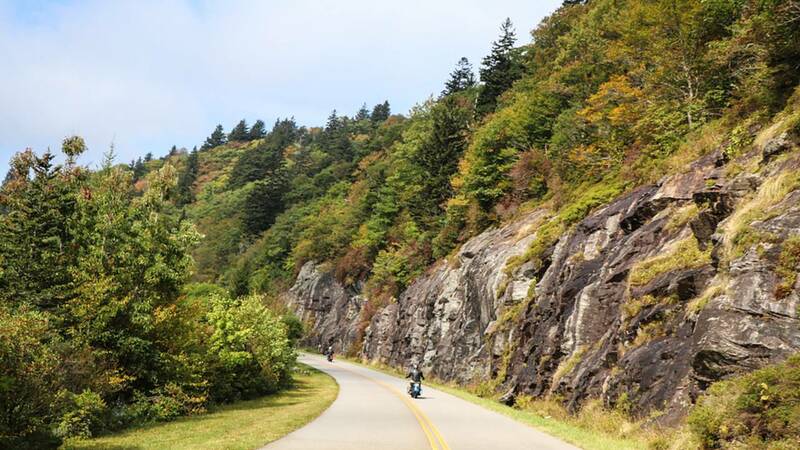 Starting with the south, you are going to spend most of your day riding through the Nantahala National Forest. This section takes you through heavily wooded sections of road which at times are like riding through a green tunnel. The turns are easy the the changes in elevation gradual, so it is an easy road for an experienced rider. It is important to keep in mind that there are not a lot of gas stations in National Forests, so make sure to leave with a full tank. Also you'll want to bring along a decent camera, because this stretch is filled with beautiful overlooks that just need a motorcycle in the image to make them perfect. Towering trees lining both sides of the road can make you feel a bit claustrophobic at times. One of the first places you'll pass is Mount Pisgah, which is also one of the few places you can stop and eat right on the Parkway. They have both a dine in restaurant and a convenience store, so you can enjoy a meal overlooking the mountains or just grab a snack and get back on the road. Further on past Mount Pisgah you'll climb up to just over 6,000-feet to the top of Richard Balsam Mountain which is the highest point on the Parkway. There is a nice overlook here but you may not get much of a view since the cloud cover is often very heavy around the mountain and surrounding valleys. 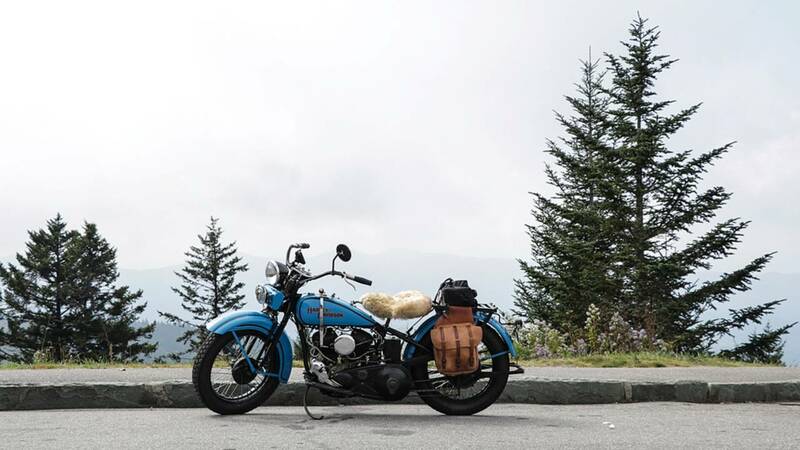 The view from the highest point on the Parkway is often just a white backdrop, but still worth the ride. As you start to descend back to slightly lower elevations, you'll want to keep an eye out for Highway 19 which will take you off the Parkway and into Maggie Valley. This slight detour is well worth your time as Maggie Valley is home to the Wheels Through Time Museum. 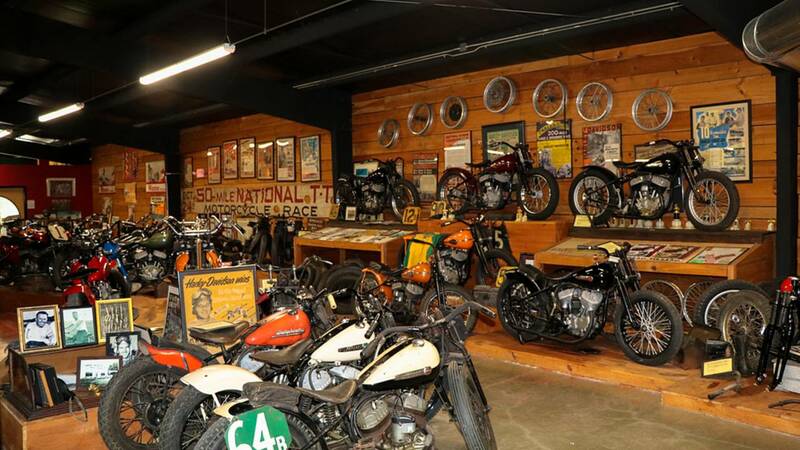 Their collection of over 250 American motorcycles (and a few cars) is worth setting a couple hours aside to check out. Everything in the museum is in running condition and owner Dale Walksler can be seen starting 100 year old machines multiple times throughout the day. The best part is you can get up close to almost every machine in the building without being blocked off by glass panels or velvet ropes. Here's a peek at just one part of the upstairs section of Wheels Through Time dedicated to vintage racers. If I ever hit it big in the Cherokee Casino, I think an Indian Four would be my first purchase. After a day of checking out things south of Asheville, it's time to see what is north of town. Right off the bat you have the Visitors Center and the Folk Art Center. 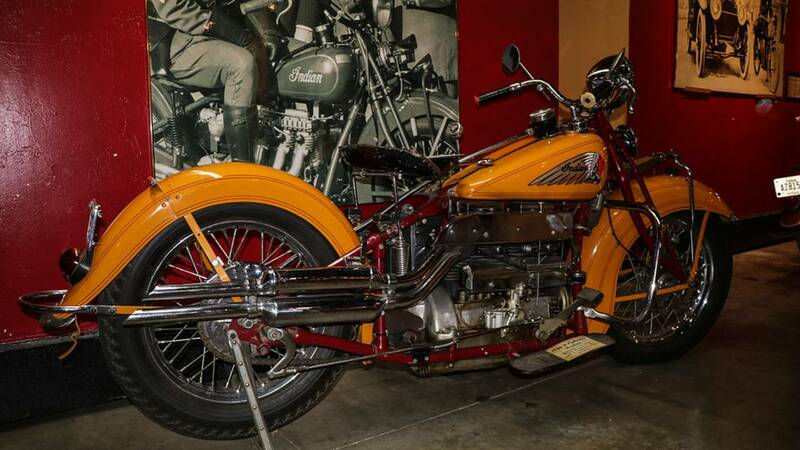 If you are into pottery, then the Folk Art Center is worth a stop, but I've never bothered as my old Harley would make quick work of destroying any pottery I tried to stuff in my saddlebags. Instead I speed on past for the Craggy Gardens located 20-miles down the road. The Craggy Gardens is a subrange of the Appalachians, known for their purple rhododendrons, but even when they are not blooming, this six mile section has some great rock formations right alongside the road. For the photography buff, there are plenty of opportunities to capture the "perfect" shot. 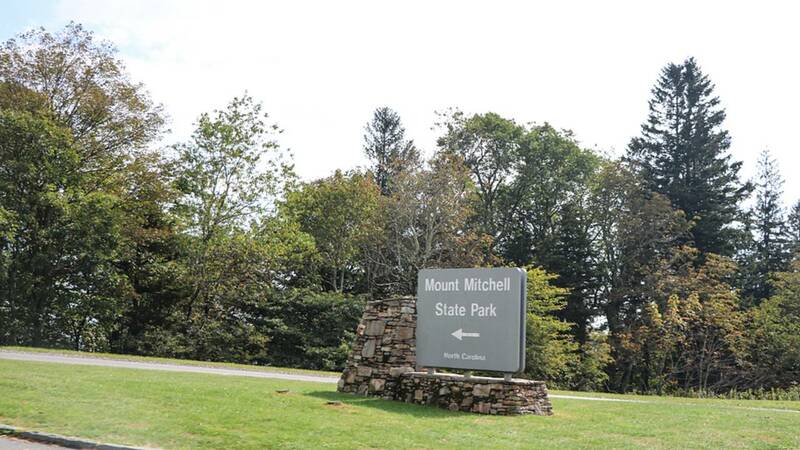 About five miles past the Craggy Gardens is the exit for Mount Mitchel State Park. Mount Mitchel is the tallest peak east of the Mississippi and the road goes right up to the top. You may expect the riding to be a little strenuous going up to 6,699-feet, but the road is actually an easy ride. Make sure you hike to the overlook which is located off the parking lot. Signage is poor and I noticed many folks just walking around the parking lot before heading back down. If you miss the overlook, it really isn't worth the ride up to the summit. Mount Mitchel is actually a State Park and not part of the Parkway system, still worth checking out though. Past Mount Mitchell is a chance to stretch your legs at a place called Crabtree Falls. 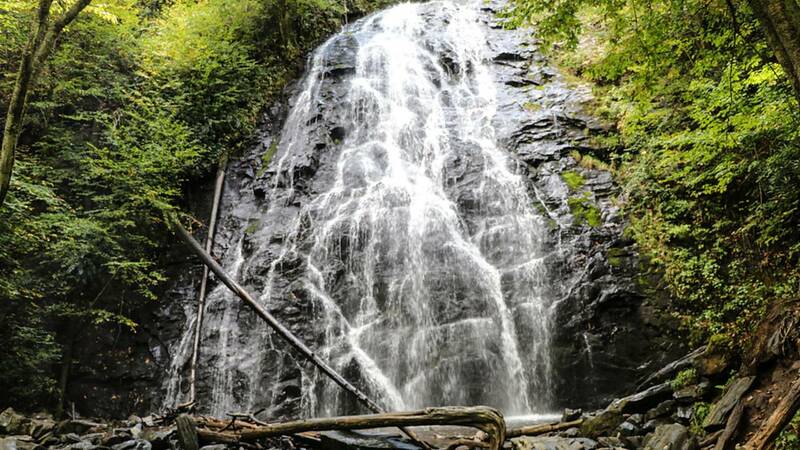 Located right along the Parkway, the hike to the falls is between 2 - 2.5 miles depending on the route you take. It is definitely not an easy stroll and you'll be hiking down a steep rocky trail, so be ready for a work out. In the end, the hike is well worth it as the 70' falls quite majestic. If you really want to see a waterfall, but hiking isn't are your list of fun activities, there are another set of falls (Linville Falls) 25 miles further down the Parkway which are much easier to access. Crabtree Falls is just a couple mile hike off the Parkway and a nice break from a day in the saddle. Leaving the falls behind, you've got another 100 miles until the border of VA and will be slowly making your way to lower elevations. Typically I don't get much farther than Blowing Rock (heck last time I only made it to Little Switzerland) before I turn back for Asheville, but if you want to make it to the end of the NC section of the Parkway you won't be disappointed. Probably the coolest part of the ride is the Lin Cove Viaduct which is a bridge that literally hangs off the side of Grandfather Mountain. For 1200-feet, you get some of coolest views of the mountains and there is something plain awesome about riding a curved bridge through sky. The Lin Cove Viaduct cost a cool $10-million to build, so enjoy your ride across it. 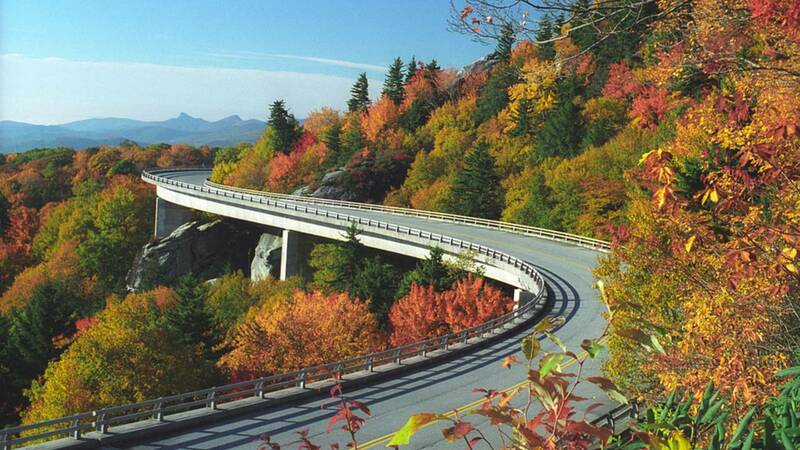 As far as roads go, the Blue Ridge Parkway ranks right up there with some of the best in the country. 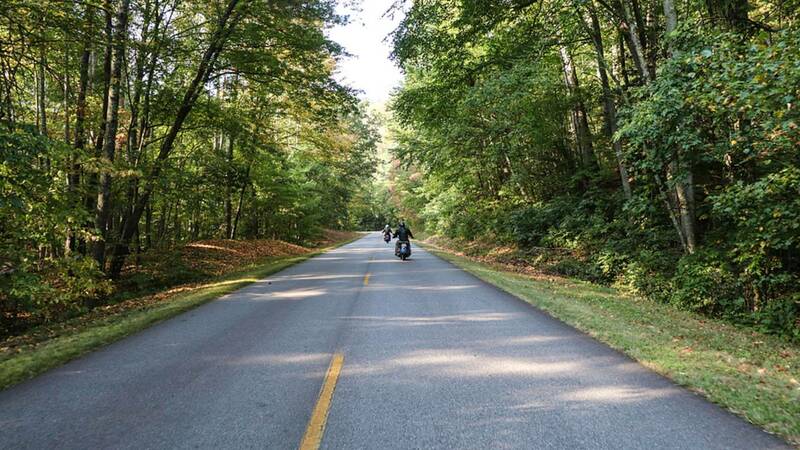 If you have a need for speed, then the Parkway's 45 mph speed limit may be a little too tame, but for those who want a relaxing ride with great scenery and enough curves to keep things interesting, then you'll be right at home. It's also a great ride for the beginner who wants to practice their cornering techniques as most of the corners are gradual enough to take at the posted speed limit and the roadway is clean and well maintained. Traffic is usually light during the week and if you are going up this time of year, I definitely recommend not riding the Parkway on the weekend as it will be loaded with "leafers" with their heads hanging out their windows looking at the leaves. Mile after mile of sweeping turns & scenic vistas makes a day riding the Blue Ridge Parkway time well spent.